This guitar is made out of Ginkgo wood by Eugen Bruddler. "Eugen's got a new guitar, and for the first time, he cut, sawed, grinded, shaped an polished it himself.. Ginkgo wood from Germany is really precious and rare. There are only a few old Ginkgo trees in Europe, on of them stood in the park of the Earl of Neipperg an was cut down by hurricane "Lothar" in 1999. The last remaining piece of that tree was used to build this instrument. A very special gift for christmas this year." Video by Eugen Bruddler on YouTube. 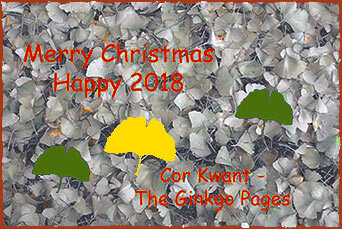 More about Ginkgo wood on my website: click here. A Shinto ritual at Kamo Shrine "Oikemono", Kamo Shrine in Kamo district of Obama City, Fukui Prefecture, Japan. Oikemono is a very rare Shinto ritual (Oikemono" means "things to bury") which has been held every year continuously since 1,000 years ago. It is a divination of crop prospects for the year, which is by putting some seeds, also Ginnan (Ginkgo) seeds, into a wooden box and checking how the seeds have germinated digging up a year later. 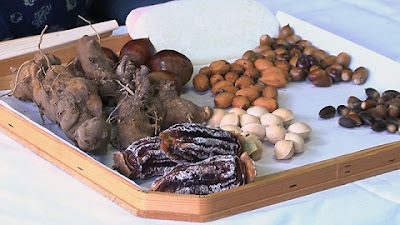 All of these seeds used to be valuable foods which people could get in everyday life in ancient times. This event is held every January 16th in the lunar calendar. The ritual lasted two hours; the result was that they would have a good crop again this year. Video by Gen Japan on YouTube. The University of New Hampshire in Durham has about a dozen Ginkgo trees growing on its campus. For more than 40 years, students have placed their bets, guessing when the leaves on the specimen outside James Hall will let loose. The winner receives a free pizza. Tradition has it that if you catch a Ginkgo leaf as it floats to earth, you'll have good luck. 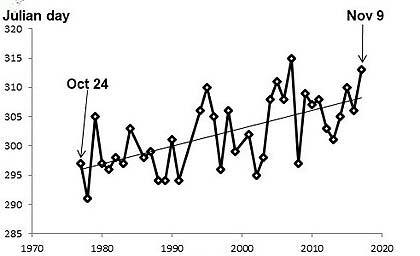 The graph revealed that the Ginkgo-dump day had been sliding forward over the ensuing decades. Every decade, the Ginkgo tree loses its leaves an average of three days later than it had 10 years prior. 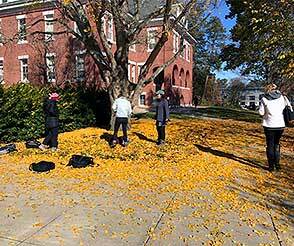 When the James Hall Ginkgo dumped its leaves this Thursday, November 9, it was the second-latest that the tree had ever hit the autumn milestone." The Atlantic had a nice story about it – where this quote come from. You should read it right here. Video by Breaking News Politics on YouTube. Ginkgo rain: leaves all fall at the same time.